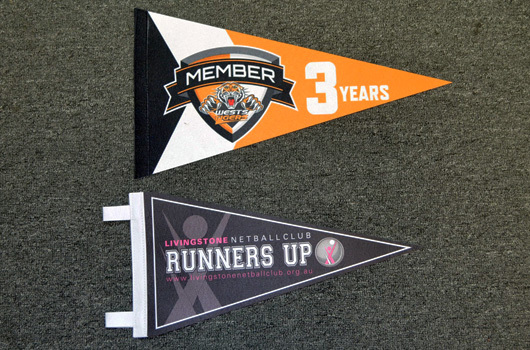 Felt pennants are used for promotional items for sport teams, community clubs, RSL’s and have really any type of use. Any design can be transferred to the felt material using heat transferring print method. Custom felt pennants bring’s a new class of awards at events. Normally heat cut edges are preferred by customers this give the pennants straight fine edges. We print our felt on one side via heat transfer. No colour or print limitations. No standard size. These are made to fit customers specifications. We can custom size to fit your needs. Production time 10 days. Rush service is available.